Track circuit signal doesn't create directional reservation at specific location. Check this saved game out. Directional reservation is not created correctly near points k and g2. I tried to solve this problem in various ways. Thank you for your report - I think that I have managed to fix this. I should be grateful if you could re-test with the next nightly build. Thank you for working on fixing this issue. I looked for the cause of this, the signal does not create a directional reservation in certain situations. Although the issue of not making a directional reservation was solved, a directional reservation may end in the middle. For example, as shown in the following picture, A signal intermediate between i and H does not make a direction reservation when the reservation start signal is k.
This train passes through the station i, so if another train comes from the other side at this time they will collide there. Thank you for testing. 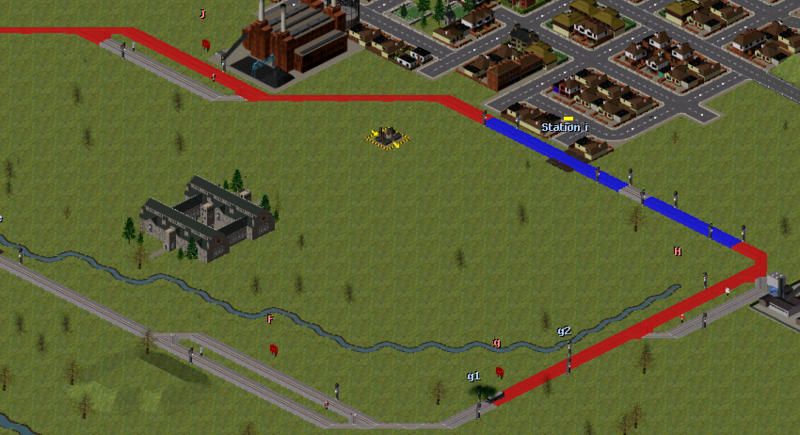 Are you able to upload a saved game in which the collision occurs at a specific place and time? As a result, the train frontal collision occurred. I'm apologize. This seems there was a mistake in my signal placement. 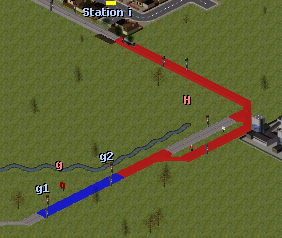 By using the two aspects signal instead of the three aspects signal so that the red reservation does not across the passing loop, collision did not occur and it worked correctly. It does not seem to be correct that you need to use only two aspect signals here - I should be grateful if you could upload the saved game demonstrating the collision so that I can try to fix this. Okey. Then, please check this saved game. I think that this collision can be avoided if it is 2 aspect signal. Thank you for the report/reproduction case: I believe that I have now fixed this. I should be grateful if you could re-test with to-morrow's nightly build. However, if there is no problem even if it crosses the passing loop, it is a little concern that the directional reservation indication is interrupted in the middle of the single line section as shown in some pictures above(reply #2), but these blank section can not be reserved from the opposite direction, or the signal can cancel the reservation from the opposite direction. Therefore the train never collides in their section. That is only display issue. Thank you for confirming. The single tile gap should not create issues as there is no way in which this can ever be reserved, so this can be regarded as fixed.